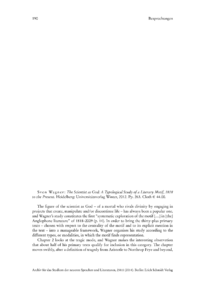 Sven Wagner: The Scientist as God: A Typological Study of a Literary Motif, 1818 to the Present.
] in [the] Anglophone literature of 18182009. In order to bring the thirty-plus primary texts  chosen with respect to the centrality of the motif and to its explicit mention in the text  into a manageable framework, Wagner organises his study according to the different types, or modalities, in which the motif finds representation. Chapter 2 looks at the tragic mode, and Wagner makes the interesting observation that about half of his primary texts qualify for inclusion in this category. The chapter moves swiftly, after a definition of tragedy from Aristotle to Northrop Frye and beyond, through brief mentions of more or less well-known texts by Hervey, Aldiss, Crichton, Cummins, Koontz, Kellett, Carr, Lovecraft, Maugham and Carter, to more sustained analyses of Geiers Floating Lords, Hawthornes The Birthmark and Melvilles The Bell-Tower.